Acer Philippines treats its loyal customers to FREE smartphones this very merry Christmas with the Buy 1 Gift 1 promo. 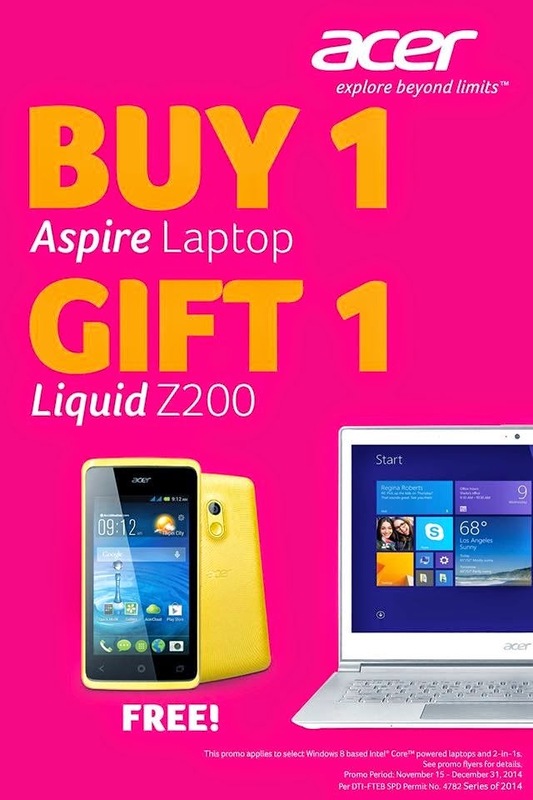 Starting November 15, 2014 up to December 31, 2014, customers simply need to buy any eligible Windows 8-based, Intel® CoreTM -powered Acer laptops and 2-in-1 devices from any of the participating stores and get an Acer Liquid Z200 smartphone absolutely FREE! When claiming through email, customers only need to submit a clear scanned copy of the required documents and email to promos@acer.com or aphi.promos@acer.com, and follow up via (02) 815-33-88 local 100 and 125. The Acer Liquid Z200 Smartphone will be shipped directly to the registered address indicated in the submitted Buy 1 Gift 1 promo claim form. Watch the new Acer TV commercial that was first aired during last night's episode of The Voice Philippines. Acer Service Centre – Manila, 1651 Paz Guazon Street, Paco, Manila. Acer Service Center – Cebu City at the AMV Brothers Building, 9 F. Cabahug corner Almendras Streets, Mabolo, Cebu City. Acer Service Centre – Davao City at the Ground Floor of Ateneo De Davao University, 8016 Roxas Avenue, Davao City. Claiming schedule at these locations are from Mondays to Fridays (9 am to 5 pm) and Saturdays (9am to 12 pm).